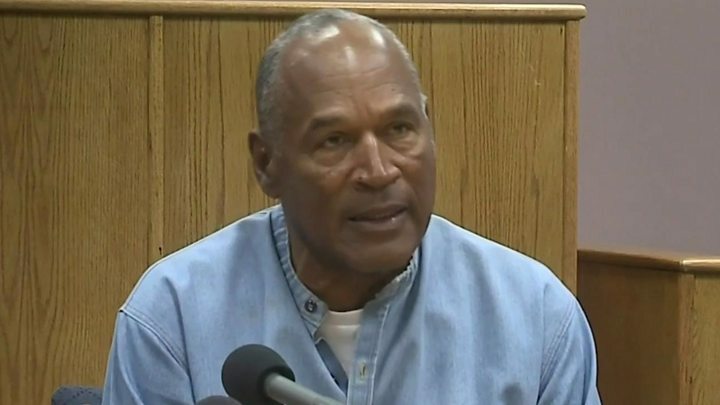 Former US football star and actor OJ Simpson has been granted parole after nine years in a Nevada prison. “Thank you!” said the 70-year-old, bowing his head as the board approved him for release. Simpson, who was acquitted for a double murder in 1995, has been serving time for armed robbery, assault with a deadly weapon and 10 other charges. He is set to walk free in October after being convicted of a 2007 confrontation at a Las Vegas hotel. The former Hall of Fame running back was found guilty in 2008 – exactly 13 years to the day after he was famously acquitted for the killings of his ex-wife Nicole Brown Simpson and her friend Ron Goldman. He and a group of five others stormed into a hotel room to confront two sports-memorabilia collectors and seize items that he claimed belonged to him from his career. The hearing for Prisoner 1027820 took place at the Lovelock Correctional Facility, a medium-security prison in the Nevada desert. Simpson told parole officials that the objects he took from the Las Vegas hotel room were later ruled by officials to legally belong to him. “I’ve spent a conflict-free life,” the prisoner said to the board. However, Simpson admitted spousal abuse in 1989 after police responded to a domestic violence call at his home. On Thursday, Bruce Fromong, who one of Simpson’s victims in the robbery, testified in favour of his release. “I’ve known OJ for a long time,” said Mr Fromong. “I don’t feel that he’s a threat to anyone. Simpson appeared to dab a tear during Mr Fromong’s testimony. The prisoner also rejected suggestions he had an alcohol problem. “I’ve done my time,” he said. “I’ve done it as well and as respectfully as anybody can. I think if you talk to the wardens they’ll tell you. In 2013 the Nevada Board of Parole Commissioners granted him parole on some of his convictions, but for not the more violent charges.